That’s the premise of our new e-book called Generosity Speaks: Designing Communication to Impact Giving. And this new 38-page resource is available to you for free starting today! We literally break down eight widely used methods of communication, and share with you multiple ideas to simply tweak things you’re probably already doing to leverage it to accelerate giving in your church. Late last year I sent a survey to more than 500 pastors and church leaders across the country. I asked “what generosity topic would you find most valuable to know more about in the coming 6-12 months?” A total of 60% of the respondents chose communication. 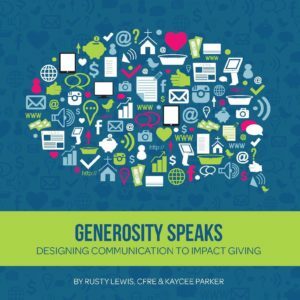 So I’m happy to provide you with a very practical resource that will take you step-by-step through eight different methods to better communicate about generosity to accelerate giving. Pastors, you will be pleased to know I am not only suggesting more generosity-based sermons (although you should preach on the topic, and you should do it intermittently throughout the year). Instead, generosity should be part of a regular and ongoing conversation. What you say (or don’t say) impacts what people give (or don’t give). It’s really that simple. Get your copy today, and impact the giving in your church for good!